Catherine Nicholson, theater director/producer, pioneering co-founder and editor of Sinister Wisdom, died June 16, 2013 of a massive stroke suffered earlier in the month. Born in Troy, North Carolina in 1922, Catherine was educated at Flora MacDonald College (B.A. ); the University of North Carolina at Chapel Hill (M.A. ); and Northwestern University (M.A. ; Ph.D in drama and oral Interpretation) in Chicago. She returned to the South to teach drama and to direct university theater. The University of North Carolina at Charlotte gave Catherine tenure and promotion to full professor. When she met Harriet Ellenberger, aka Desmoines, at the Charlotte Women's Center, Catherine was fifty-three and two decades into her teaching/directing career. By the end of the academic year 1974-75, Harriet had moved in. Catherine then resigned her position and the couple launched Sinister Wisdom, subtitled "A Journal of Words and Pictures for the Lesbian Imagination in All Women." Sinister Wisdom changed Catherine and Harriet's lives completely and was exhausting work. After five years of traveling, moving (to Nebraska), editing, typesetting, doing production for the journal, Harriet fell ill with Graves' disease; and in 1981 the couple turned Sinister Wisdom over to new editors, Michelle Cliff and Adrienne Rich. Then Goddard College hired Catherine full-time for its Feminist Studies Program and the couple moved to Plainfield, Vermont (where they were to split up in the mid-80's). 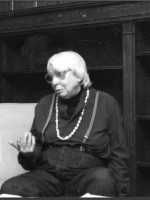 At Goddard, Catherine directed feminist theater and in 1984 produced the world premiere of Monique Wittig's "A Constant Journey." When she retired from Goddard, Catherine moved to Durham, North Carolina, where she enjoyed an active intellectual and social life in a community of women her age. When Catherine began to need help taking care of herself, her goddaughter moved her to Connecticut, where she died. Catherine Nicholson is remembered as a dedicated lesbian feminist cultural worker, founder of Sinister Wisdom, gifted theater director, writer, thinker, teacher, conversationalist and loyal friend.